Gorgeous Executive Home Nestled on Just Over Half an Acre in Perdido Bay Country Club Estates, a Deed Restricted Golf Community, Minutes from the Sandy White Beaches of Perdido Key and Grand Lagoon Park! 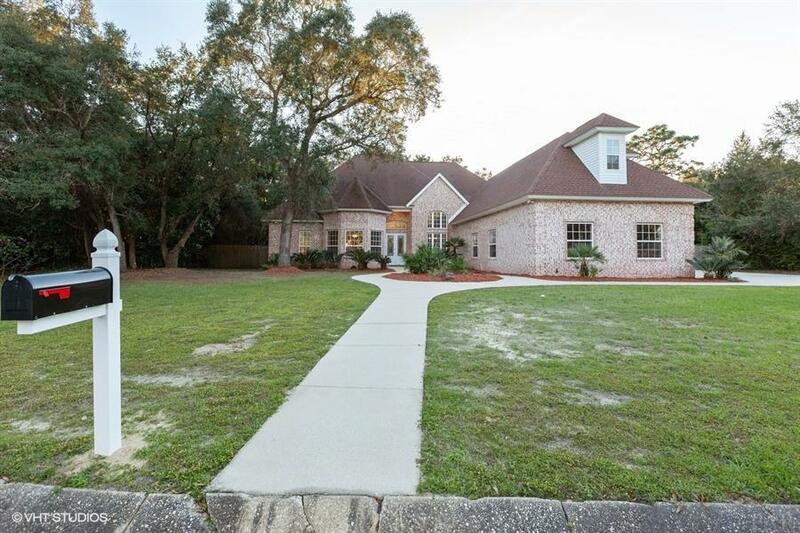 Fantastic Location on Premier Cul-de-sac ** Just off Prestigious Pale Moon Drive Across the Street from Perdido Bay! This Spacious 4 Bedroom, 3 1/2 Bath, 3 Car Garage Luxury Home is Move-In Ready! Enter Through the Front Foyer into the Great Room which Features a Fireplace, Built-In Shelving and Double French Doors to the Covered Patio and Fenced Backyard! There is an Office to the Left and Formal Dining to Right Plus an Easily Accessible Half Bath ** Chef&apos;s Kitchen Features New Stainless Appliances, Granite Counters and Cherry Finished Cabinets Plus a Breakfast Bar and Breakfast Nook that Overlooks the Backyard. This is a Split Floor Plan with the Master Suite Featuring Sliding Glass Doors to the Backyard, HUGE Walk-In Closet and Private Bath with Double Vanity, Garden Tub, and Separate Shower. The 3 Additional Bedrooms are on the Opposite Side of the Home and are Both a Comfortable Size. There is a Full Bath Located at this End of the House along with a Pantry. Off the Hallway is the Laundry Room that has a Wash Basin and Additional Cabinets and Access to the Garage and the Upstairs! The Upstairs has a Bedroom with Dormer Windows and a Bath with a Shower. The Home Features New Vinyl Plank in the Kitchen, Great Room, Dining Room, Office, Half Bath and partial Hall. The Bedrooms have New Neutral Carpet and the Bathrooms are All Neutral Tile. Recent Updates Include New Hot Water Heater, New Garage Doors, Most Light Fixtures and Full Interior Paint! All information is taken from the Tax rolls and is deemed reliable but not guaranteed. All buyers to verify any and all information including but not limited to square footage, school district, room count, amenities, lot size etc and satisfy self.